Shanghai Airport Transfer Company provide Shanghai tours, cheap tour packages, Shanghai day tours, Shanghai layover tours and all things to do in Shanghai, take you visit Highlights of Shanghai! Zhujiajiao Water Town Tour --from USD80 per person! Huangpu River Night Cruise Tour --from USD60 per person! 2 Days Shanghai Classic Tour --from USD100 per person! 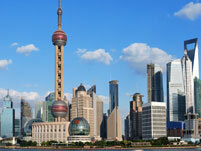 3 Days Shanghai Classic Tour --from USD160 per person! Zhouzhuang Water Town Day Tour --from USD80 per person! Suzhou Classic Day Tour --from USD100 per person! Hangzhou Classic Day Tour --from USD120 per person! 2 Days Suzhou Classic Tour --from USD180 per person! 4 Days Yellow Mountain Tour --from USD520 per person! Shanghai Classic Visa-Free Transit Day Tour --from USD80 per person! Shanghai Maglev Subway Day Tour --from USD70 per person! Our guide and driver will pick you up at 09:00 in the hotel lobby, visit Yu Garden, it's well worth a meander through the Yu Garden, which has many scenic courtyards decorated with baroque rockery, pools and flora, all connected by corridors and passageways. Lunch at the Revoving Restaurant on the top of Oriental Pearl Tower, you will have an overall view of the city while have you lunch. In the afternoon, you will visit Lujiazui Financial District, as an important financial district in Pudong, Lujiazui is the fastest growing area in Shanghai, even in China. People also call it East Manhattan. There have the famous international hotel, Bank Tower, and shopping mall, the three of China's tallest buildings are in this area. One is the Oriental Pearl Tower, the others are Jin Mao Tower, Shanghai World Financial Center. You will visit the tallest one Shanghai World Financial Center which is 492 meters high.